Toyota’s recent Guild 21 call revealed a couple of extra collision repair-related details that weren’t by themselves enough for a full article but were too interesting not to share. We’ve rounded them up for you here. Though automatic high beams do demand a Toyota’s camera sensor be installed properly, the headlights themselves aren’t too complicated to calibrate, according to Toyota Collision Repair and Refinishing administrator Agustin Diaz. 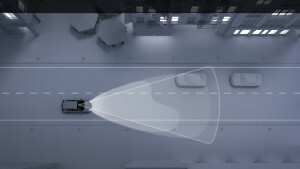 The advanced driver assistance system turns on the high beams when a Toyota is driving 21 mph in dim conditions, Diaz said. The lights switch back to low beams when oncoming traffic is detected, he said. Adjusting the headlights involves a couple of screwdrivers, a 2-meter-by-4-meter (6.56 feet by 13.1 feet) white piece of paper to be used as a screen, and up to 7.62 meters (25 feet) of space between the front of the vehicle and screen, based on the repair procedure excerpts Diaz showed. “Toyota doesn’t want you to spend thousands of dollars in fancy equipment,” he said. After drawing the correct horizontal and vertical lines on the paper per Toyota’s instructions, a shop would simply adjust the aim with a screwdriver until the beams landed where and how Toyota wanted. “It’s really simple,” Diaz said. The aluminum strut tower in the very-mixed-material 2018 Lexus LC is joined to the steel side member in such a way that the part can only be sold as a single unit, a Toyota collision repair trainer told a Guild 21 audience Thursday. The two parts are riveted together, but they’re also joined using a “special glue” that can compensate for the different metals’ thermal expansion rates, Toyota collision repair training administrator Agustin Diaz explained. It’s sold as an entire unit; not separate parts and rivets. “Never, ever try to repair it,” Diaz said. While the LC will be a relatively rare vehicle (it starts at $92,000), it’s possible that other more common luxury and mass-market vehicles could see such constraints as mixed-material designs become more common. So keep on your toes and check the repair procedures. You know how OEM trainers are always saying look up repair procedures anew every single time you start a repair because the instructions frequently change? During the Guild 21 call, Diaz displayed an excerpt from the instructions for installing a lane recognition camera on a 2016 Toyota Camry. The date stamp on his slide indicated those instructions were last modified Feb. 16, 2017. When we looked up the same instructions on Toyota’s tech information website this month, we noticed that the document had already been updated a little more than a month later: March 27, 2017. As Diaz didn’t show the document in its entirety, we couldn’t tell what exactly had been changed. But whether it was an altered instruction, corrected typo, or nothing at all besides a new date stamp is besides the broader point: The instructions really aren’t static documents which stand pat for the life of the vehicle. Consult repair procedures fresh every time or risk incorrect (or merely overly complicated) work on a customer’s car.